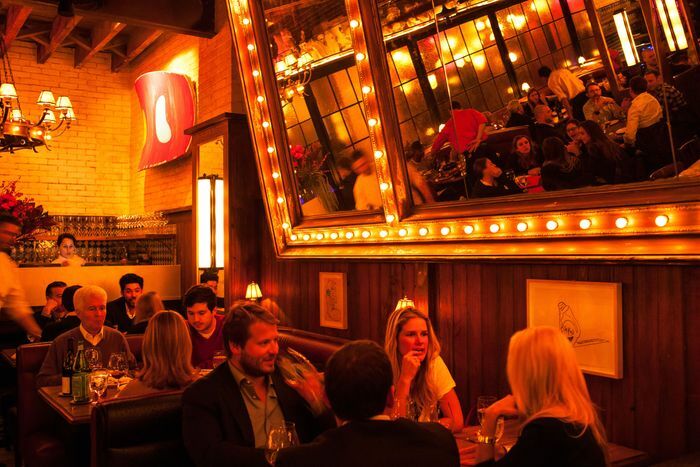 Our newly updated list of the absolute best places in town for a bite of classic haute Parisian (or Lyonnaise, or Provencal) cuisine includes a couple of New York landmarks that we feel transcend the classic less-than-haute “bistro” label, and deserve a place in the city’s great pantheon of what my dear, departed Upper East Side grandmother used to call “those fancy French joints.” Here are the absolute best places in New York City for everything from a bite of île flottante or sole Meuniere, to a furtive midnight platter of steak frites. 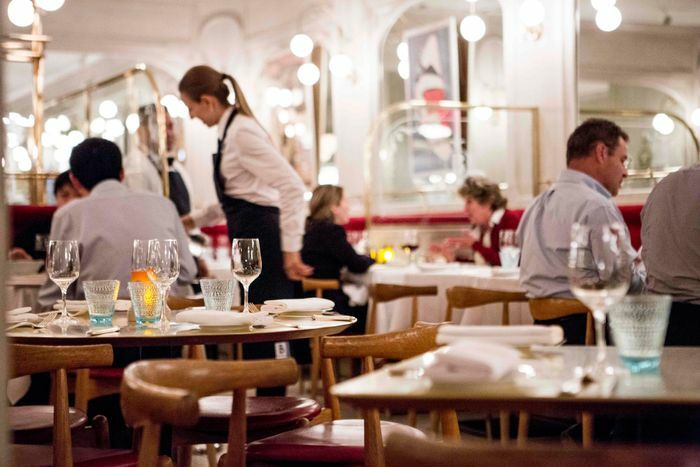 To the staunchly conservative Francophiles who dare suggest that this seafood-themed, fusion-tinged, quintessentially New York restaurant is not really French at all, the chef and co-owner, Eric Ripert, has a stock reply. “It’s so silly,” he says. “Look at our technique.” He’s talking, of course, about the first-class kitchen, which is stocked with sauciers, fish cooks, and pastry chefs, all of them skilled in the delicate and ancient art of haute cuisine. He’s talking about the dining room, which — both in service and style — remains as close to the Parisian three-star ideal as any dining establishment in this increasingly one-star town. And he’s talking about the ever-evolving menu, which still contains some of the finest examples of grand French cooking (sautéed Dover sole, lobster à l’américaine, truffled squab with red-wine sauce, the desserts) that money can buy. Fans of the uncluttered, traditional style that Daniel Rose cultivated during his time in Paris (he comes to the big city by way of Paris and his hometown Chicago) might be slightly taken aback by the baroque grandeur of this downtown dining room, which the restaurateur Stephen Starr and his designers have fitted with all the trimmings, including a state-of-the-art open kitchen populated by toque-wearing cooks, wagon-wheel-size chandeliers hanging from the tall ceiling, and a series of long, plush banquettes. But there’s no quibbling with the elevated examples of traditional “cuisine bourgeoise” on the menu, like quenelle de brochet poured with bubbling lobster sauce, slivers of veal tongue dabbed with caviar and crème fraîche, and that old rustic delicacy tout le lapin (“all of the rabbit”), which Rose and his army of cooks prepare three equally impressive ways: as an elegant, gourmet roulade; roasted with mustard sauce; and bubbled in a meat-and-vegetable stock, which tastes, when you close your eyes, like the essence of classic French country cooking. The great master of haute uptown cuisine installed a glittering new kitchen at his venerable flagship establishment a while back, and the endlessly proliferating (and pricey) tasting-menu options continue to attract big-money gastronauts from far-off places like Dubai and Beijing. But the best way to experience the essence of what certain plutocrats around the neighborhood like to call “our local canteen” is to belly up to the bar just outside the ornate dining room early on some weekday evening, call for one of the inky northern-Rhône wines from around Daniel Boulud’s native Lyon, and bargain with your bartender for an à la carte taste of dishes from the old French canon, like wood-roasted pigeon (if it’s on the menu), opulent helpings of veal with artichokes, and dainty portions of suckling pig that the kitchen simmers in milk and garnishes with the freshest farm vegetables from upstate. 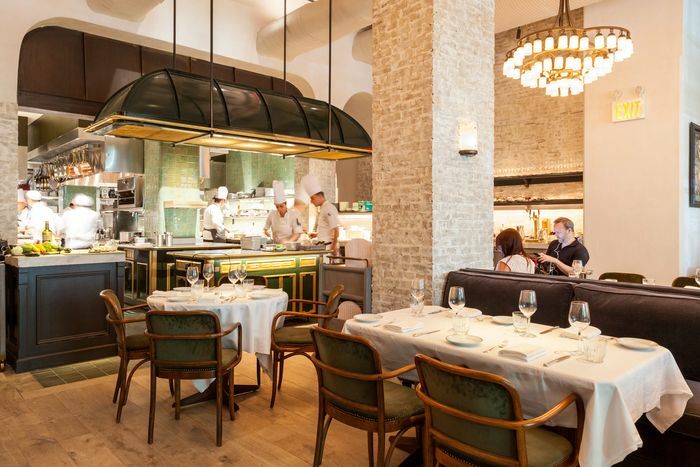 Riad Nasr and Lee Hanson’s much-praised Tribeca brasserie, which opened in the spring of 2018, isn’t the most ambitious restaurant around town, nor is it the most antically theatrical, and their mentor, Keith McNally, would certainly have questions about a few of the aesthetic choices in the clamorous, sparely decorated dining rooms. 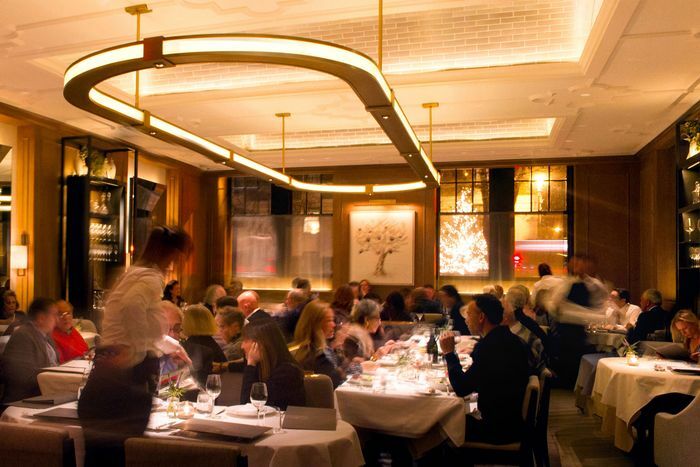 But the return to the kitchen of these two great masters of what could be called New York brasserie style is certainly one of the most edifying comeback stories in recent memory. And for those of us who are fans of classic, chef-centric specialties like grainy, perfectly turned pork rillettes, or roast country chicken, or calves’ brains prepared in the Grenobloise style, so is the cooking, which combines the elevated qualities of first-class ingredients and age-old technique with the timeless, comforting pleasures of a good old-fashioned feed. The chef, Markus Glocker, is Austrian, but depending on the season and on the chef’s mood, you will find the the prix fixe menu at Drew Nieporent’s elegant, Michelin-approved Tribeca establishment peppered with numerous elevated renditions of French classics, like steak tartare, braised porcelet shoulder, and numerous tarts for dessert. It’s not the kind of traditional, restaurateur-chef collaboration that you see much anymore in this increasingly transient dining town. 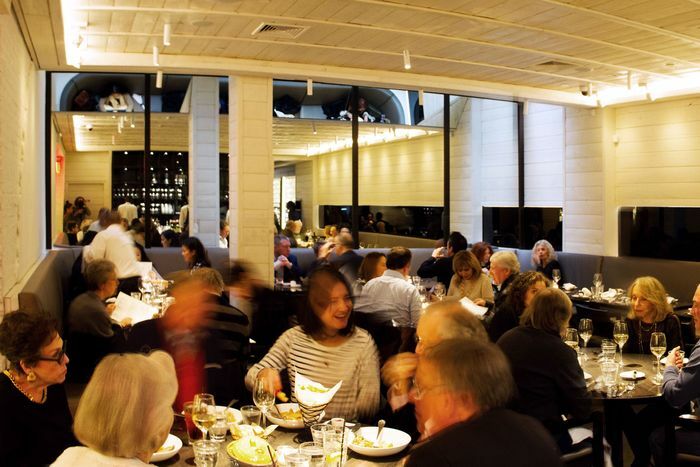 And at $95 (or thereabouts) for four courses, you won’t find a better gourmet deal in the city. There’s no corkage fee on the first bottle you bring through the door, and if you have the funds, Nieporent’s collection of Burgundies remains as impressive as ever. 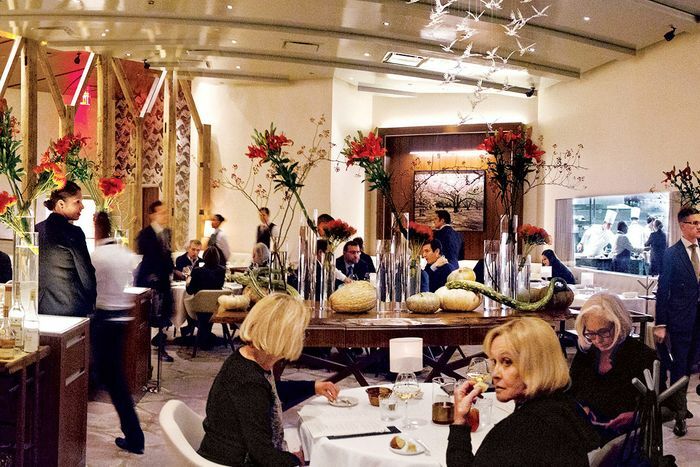 Gabriel Kreuther is one of the masters of the vanishing art of “haute cuisine” in the city, and the much-praised fine-dining portion of this elaborate midtown destination has its refined charms. But if you work or live in the vicinity of Sixth Avenue and 42nd Street, chances are you’re spending a lot more time in the elegantly appointed, somewhat more modestly priced “lounge” portion of the restaurant. The libations (cocktails and wines) in this elegantly casual space are worth a special trip (the Alsatian whites, the Martini), and so are Kreuther’s bar-menu riffs on the great Alsatian comfort dishes of his youth, like tarte flambée (there are numerous varieties), truffled liverwurst, and pots of tripe braised to a happy tenderness in red wine, and served, in the ancient Alpine tradition, with a crunchy gratiné top. 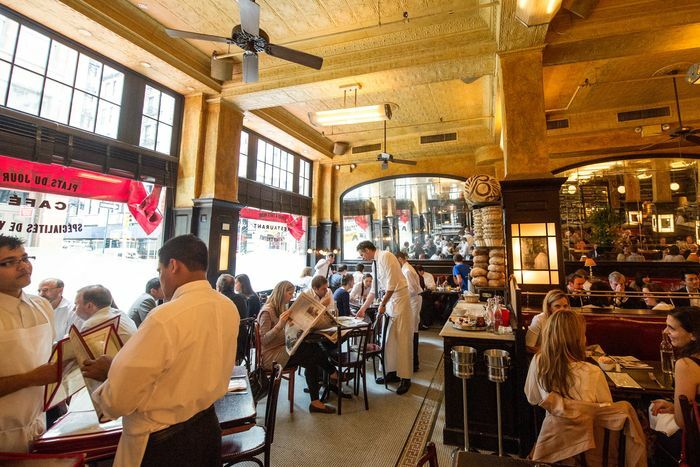 It’s true that the Masson family, who’ve presided for decades over this last of the venerable midtown French restaurants, has been in a state of not-so-quiet turmoil in recent years (the matriarch, Giselle, died at the age of 89 in 2014, and the former front-of-the-house man, older brother Charles, was banished from the premises). It’s also true that the quality of ageless mid-20th-century specialties on the famous frog-decorated menu — like lobster bisque, grilled sole, and crêpes flambées — can go up and down with the passage of time. 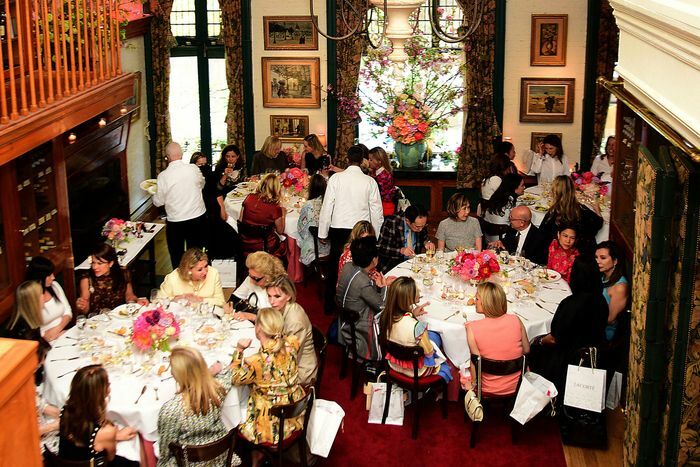 But the clientele is as loyal as ever, the famous flowers are still delivered each morning to be placed in tall vases around the famous dining room, and as long as the family manages to hang onto the midtown townhouse off Fifth Avenue, the gilded, rose-scented, essentially French pleasures of this fin de siècle fine-dining landmark will endure. 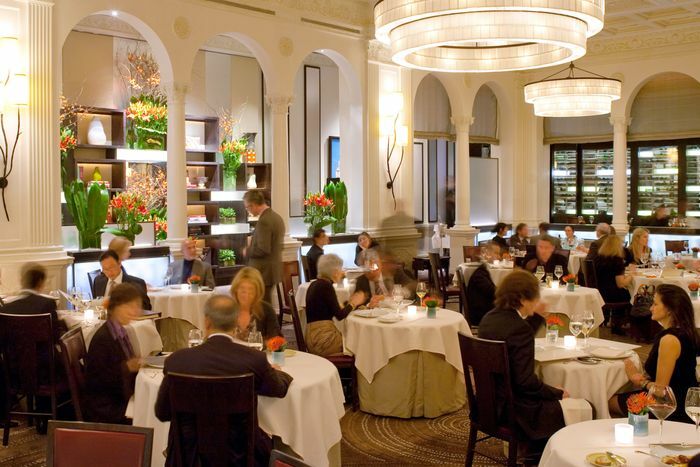 After all these years, Keith McNally’s endlessly discussed, much-imitated masterpiece is that rare “Franch” restaurant which manages to out-glow many of the real-life brasseries and bistros that you’ll find near the banks of the Seine, while remaining, in spirit and style, the epitome of New York bustle and chic. Despite the endless waves of competitors and the increasingly crowded number of tables on the dining room floor (along with the slightly shrinking portions on the plates), there is still no more Parisian breakfast available anywhere around town, in our humble estimation (the croissant, the fish bowl sized cafe au lait, the omelette with herbs, the eggs en cocotte), than the one you can get here beginning every morning at 7:30 a.m. There’s no better place for a faux-Parisian lunch either (although it’s best to make it a late lunch to avoid the crowds), or to enjoy consistently satisfying versions of everyday French bistro classics (moules frites, steak au poivre, l’escargot, the excellent steak tartare), followed by a baguette or two for the road from the superb bakery next door. 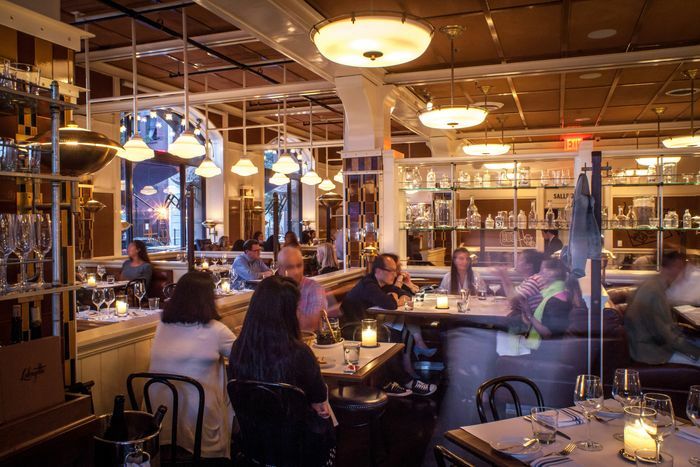 Michael White is one of the city’s great pasta savants, but at this pleasantly gilded Park Avenue establishment, he and his seasoned team of cooks turn out a variety of durable French classics designed specifically for a certain kind of settled, uptown Francophile palate. Go at lunchtime when, in the words of one our neighborhood spies, it doesn’t feel like “you’re eating dinner in the middle of a train station,” and pay attention to the hors d’oeuvres section of the menu, which is chocked with familiar delicacies like smooth rounds of foie gras terrine, excellent escargots from Burgundy dressed with bits of roasted bone marrow, and a superior steak tartare, which is best enjoyed with a side of golden, crunchy frites, served with a proper uptown flourish in a silver cup. 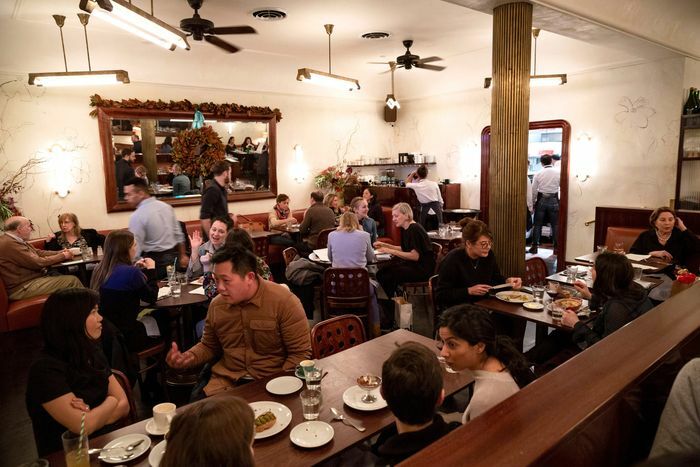 Harold Moore has long been one the city’s masters of classic French cooking, and at this homey, satisfying, deceptively sophisticated neighborhood joint in the West Village he indulges his passion for the bountiful cream- and butter-soaked favorites of the old French canon. Most everything on the crowded menu is worthy of consideration provided you’re not on a diet, but pay special attention to the old fashioned ‘plats classiques’ like lamb chops served with stiff helpings of potato gratin, vats of traditionally prepared coq au vin and cassoulet, and Moore’s famous roast chicken for two, which the kitchen prepares with slivers of truffle inserted under the crackly skin, a boat of foie gras leavened bread stuffing on the side, and several heaping spoonfuls of smooth, buttery pommes puree. Like all great Parisian cafés, Marie-Aude Rose’s stylish little downtown dine-and-shop operation (it’s located in the front of a Soho boutique) has a little something for everyone — including, if you wish, bundles of fresh-cut flowers that you can order when you arrive for your lobster salad or bowl of chestnut velouté, and pick up after you’ve finished eating. Our favorite meal is breakfast, when the kitchen serves bowls of crème anglaise with slices of warm brioche and the sun slants into the room in a particularly Parisian way, but you can get a superior version of boeuf bourguignon starting at lunchtime, along with a fine selection of that durable Breton-style speciality, buckwheat crêpes, which the kitchen folds with creamed chicken, and serves, speckled with sugar and a squeeze of lemon, for dessert. The greatest of all French masters, Alain Ducasse, has never managed to find the key to the frazzled, finicky, New York dining palate, so at this much-reworked midtown outlet of his well known Parisian bistro, he and his longtime lieutenant, Laetitia Rouabah, stick with the tried and true basics that have satisfied generations of diners on both sides of the Atlantic. You won’t find a better cassoulet in this part of town than the properly sturdy one you can get here; not to mention servings of escargot drenched in garlic and parsley butter by the dozen; soft, bouncy quenelles en brochette set in puddles of orange Nantua sauce; and decorous slabs of the house paté en croute prepared according to Lucien Tendret’s original recipe which, as the loquacious servers will happily tell you, dates all the way back to the year 1892. 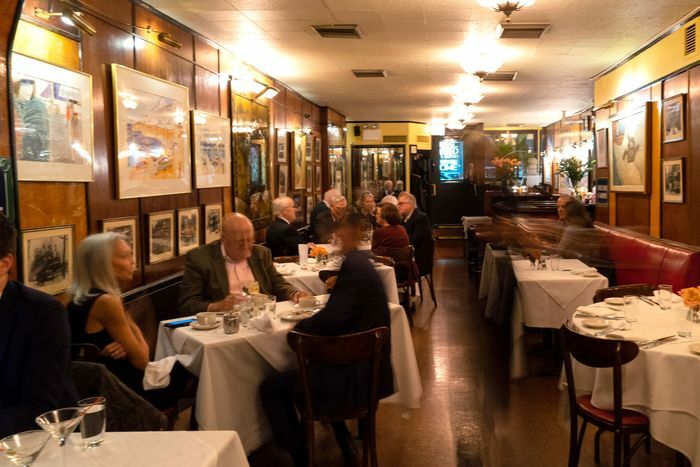 Catherine Treboux runs this venerable midtown restaurant, just north of Bloomingdale’s, as a kind of living museum to that mostly vanished era when French cuisine ruled the upper levels of the dining world in New York. The menu hasn’t changed in what seems like centuries, and if you ask politely, Mme. Treboux will point out various tables where ancient bold-face names used to dawdle over their Champagne and cigarettes, including the exact banquette in the back corner of the room where Hemingway used to sit when he dropped in for a bottle of wine (or three). The specialities of the house are the same now as they were back then — coq au vin, sole amandine, veal in its various forms (the tripe “à la mode de Caen” is legendary among old-time tripe connoisseurs), and a near-perfect rendition of that most magically French dessert of all, l’île flottante. The founder of this small, Paris-based restaurant empire, Antoine Westermann, has long been known for his facility with what is, next to cheese, that most Gallic of proteins, the barnyard chicken. So it’s no surprise that the roasted, broiled, and fricasséed birds are great at this bustling, Flatiron establishment — get the classic Alsatian “Baeckoff” for the table if you’re feeling flush, or the exceptional coq au vin for lunch, and although excellent versions of roast goose and whole quail pop up on the menu — save plenty of room for the old ancien régime desserts like baba au rhum, profiteroles, and a giant “to share” mille-feuille which is the size of a small toaster. Like some of the city’s other trendy brasseries, Andrew Carmellini’s version offers plates of fresh oysters, newfangled versions of duck au poivre, and twirls of skinny golden frites in soft paper cones. Unlike the others, there’s also a Balthazar-like boulangerie up front, where you can purchase fresh-baked croissants and pointy baguettes and ogle trays of overpriced pastries displayed under glass. 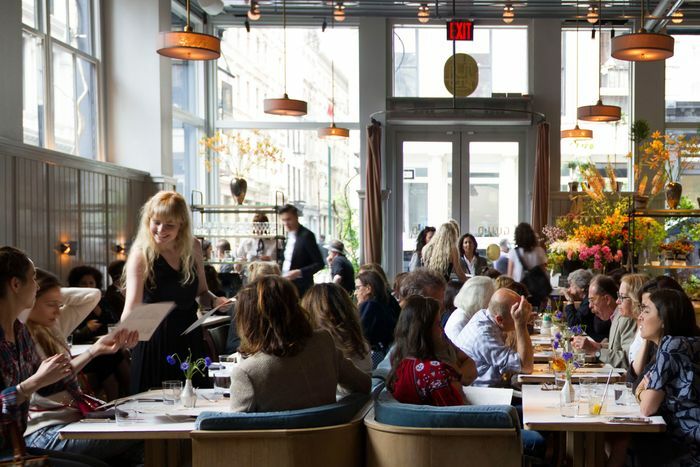 The tall, airy room on Lafayette Street features Continental-style picture windows and spacious coffee-colored banquettes, and it’s easily the prettiest, most workable space that Carmellini and his team have occupied since they began hatching restaurant ideas years ago. As the name indicates, the focus at this restaurant is on French cuisine, although the “Dirty” influences appear to come from all over the map. The enticing, beautifully scripted menu is divided into the usual timeless categories (“Hors d’Oeuvre,” “Salade,” “Poisson,” etc. ), but look closely and you’ll see mille-feuille with seasonal curry and green garlic, duck à l’orange with ras el hanout and preserved orange, and a lamb burger with cumin onions. Die-hard fans of rich French cooking will enjoy the sturdy lunchtime croque monsieur, however, and dishes like the steak frites and the cote du boeuf (the former featuring a bone-in New York strip and a lavishly rich green peppercorn sauce, the latter a small boat of classic Bearnaise).